22 Comments As an Amazon Associate I earn from qualifying purchases. 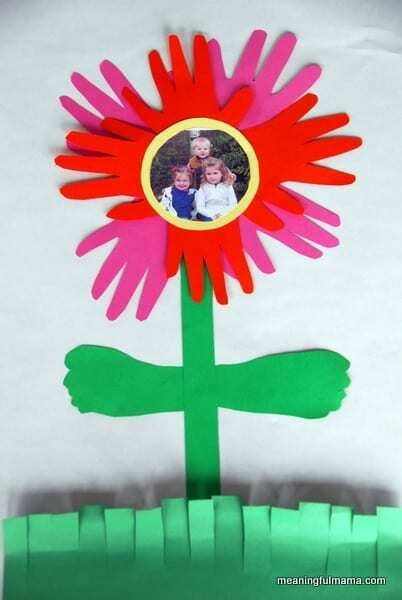 Last year we made these flowers for Mother’s Day. The grandparents loved them, so I thought I would pass the idea along to you this year. So, we made another one. The pedals are the girls hands while the leaves are Corban’s feet. 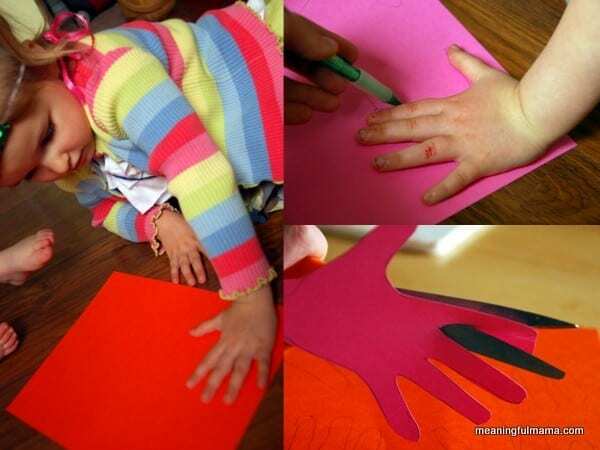 The first step is to start tracing your children’s hands and feet. Again, the hands will be the pedals and the feet become the leaves off the stem. Trace and cut them out. You’ll also want to cut out a circle for the center and a picture to go on top of that. Our big circle was 3 1/2 inches in diameter with the picture cut a tad smaller. You’ll need to cut another circle to glue things down to and a green stem. Above are all the pieces you’ll end up needing to assemble. The final step is to put together your flower. 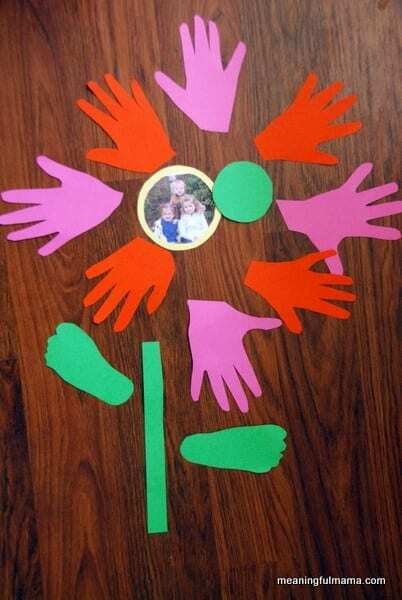 We glued all the pink (Abby’s hand) onto the green circle – one facing up, down, left and right. The next is to take the orange (Kenzie’s hand) and glue to fill in the in between spaces. Next, glue on the center circle with the picture on top. Our larger circle was 3 1/2 inches in diameter. Finally, glue on the stems and leaves (Corban’s feet). A wonderful flower to give to the grandmother in your life. New follower Sugar Bee Blog Hop! Loves this idea. I have a preschool.Excellent Mother’s Day presents! Thanks! Thanks! You’ve got a great site too. Following along as well. Cool. It’s a fun one. Such a cute idea for mother’s day. I love the bright colors too. We would love to have you come and link this idea up at our Bright Colors link party. All linked up. Thanks so much for inviting me over. This is the best idea for a Grandma for Mother’s Day. Thanks so much for linking up your posts to Creative Thursday. I love the cake you made for your friends daughter. It turned out beautiful. I can’t wait to see what you link up next week. Thank you so much, Michelle. Thanks for hosting too. I appreciate your comments! Oooo I just pinned this! I love how you incorporated the feet as well as the hands. I think I may have to make this soon with the kiddos. 🙂 I would love it if you shared this at my linky party this week: http://www.artistic31mama.com/2012/04/fabulous-fridays-linky-party-7.html Thanks! This week has gotten away from me. This Friday? These are so cute!! Thanks for sharing them at Sharing Saturday!! I was totally thinking “what a great grandparent present” as I was scrolling down. So funny you shared that in the last sentence! Thanks for your great ideas on Saturday Show & Tell! I love intentional parenting! Thank you so much for the feature on your site. I really appreciate it. Thank you so much for hosting and commenting. I appreciate it. Another great idea! These are my favorite kinds of mother’s day activities to do because they grow up so fast. I have a card that I saved that has my daughters’ hand prints and now she is much bigger. I am so glad I saved that card. 😉 New Follower! Hope to see you at True Aim. Just poking around your site. I love it. You are trying to accomplish so many of the same things I am. I just made a long comment on the vegi post, and you’ve got me thinking. Following you now too. 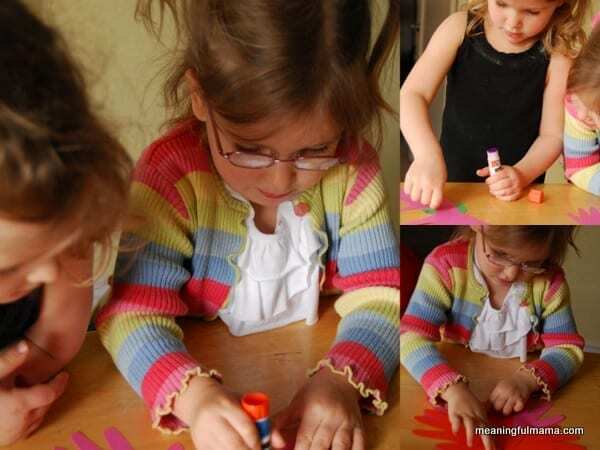 I like the kids on the blog…..they are so lovely….so funny you share it. Thank you for commenting! I hope you will stop in again.